Traditional v 21st Century language translation methods. Which are you? This is an interesting story that really makes you think about language acquisition. For me I am left with the feeling that traditional methods are wholly useless, and no matter how long a person tries to learn a language or how much money they spend then they are already setting themselves up for a fall. However people still tell us if we are to communicate across language then we must speak another language. For me I think we just need to simply communicate. It is difficult to acquire language later in life because the brain loses its elasticity. In terms of learning new languages past the age of seven, Kuhl posits that the “window of learning” stays open longer for children who were exposed to different languages as babies. I believe that if this research is true then those who have had no exposure to other languages as a child, will struggle as adults and depending on when this influence stopped their wired connections in the brain are already being depleted. Kuhl found early language skills predict future reading abilities, and skills not developed early are difficult to remediate later on. This is where I believe EMASUK comes into its own. We don’t want people to fail. We understand that not everyone is a linguist, not everyone can learn many languages yet the way people are moving globally this is in some cities and expectation. What we do all want to do is communicate whether with colleagues, customers or other adults, no matter what field you are in. For the vast majority of us that means recognising where we are and then looking for a way to bridge the gap. Our award winning Talking Tool called Two can Talk or ClaireTalk (in health settings) does this easily and relatively cheaply. Using two key boards and 26 languages it is possible to communicate across these languages simply and effectively at low cost 24 hours a day. So which will you be? use the toosl and knowledge available to me today to develop my communication skills? If you chose number 2 the contact us for more details info@emasuk.com, 07824612965 for more details. I stood in hospital today at the bed of a man who had breathing difficulties and a cough, his heart rate was rising and his breathing getting shallower and he obviously couldn’t understand what we were saying to him, he looked frightened, he mouthed something that wasn’t English. I stood there and wondered what I could do next. How many of our readers that are doctors and nurses find themselves in this position on a daily or weekly basis? We have made this situation a thing of the past. Clairetalk is a revolutionary communications system that speaks your text (similar to Siri) in 25 languages and even has yes and no paddles for those with poor literacy skills. The use of the new ‘app’ adds portability making it even easier for you as health professionals or outreach visitors to talk to your patients. With a choice of over 25 languages you can easily converse with patients reassuring and explaining to them about their health conditions. The Clairetalk app is a portable translation system that works on any tablet or your smart phone. Just to reassure new readers of this blog in schools teachers are using it successfully with parents and their wider community so although it may be new to you, young people and their parents may already be versatile in using this technology. In councils the tools are being used with new arrivals particularly for housing matters and where parents have used it in schools are asking for its availability in their offices. 5 x Clairetalk app = £999.00 representing good value for money. 5 x Clairetalk app plus 5 x I-Pad = £4950 making you in charge of your communication, at a budgetable annual cost, 7 days a week, 24 hours per day representing a price of just £14.00 per day for 5 people or less than 3 pounds per person. NO surprise bills – As a manager you will know what the cost is making it completely budgetable for the foreseeable future. 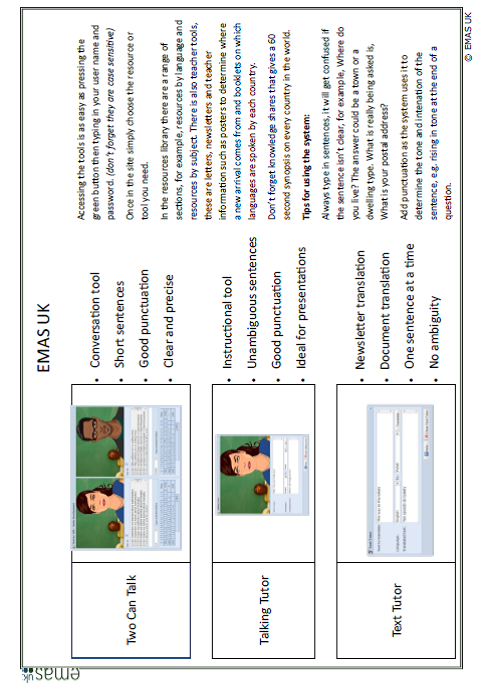 Contact us at info@emasuk.com or 0845 009 49 39. For current members who would like to add the app to their tools please contact info@emasuk and ask for your members discount. Just recently people in the education world have been asking for a brief rundown of how the Talking Tools (Talking Tutor, Text Tutor and Two Can Talk) work and their best uses. Many are really surprised at how easy it is to use and access and say ‘it really is as simple as typing in’. Accessible 24/7 wherever you are this makes it a value for money solution. So we have created this poster for your walls or to use in training situations or review demonstrations. NB in Health, Business and Public services ClaireTalk although bespoke is similar to Talking Tutor. If you would like a digital copy of this poster contact us at info@emasuk.com. Thursday will see us celebrating the European Day of Languages. Thirty years ago many of us would only have been aware of a minority of languages depending on what was known around the area where we lived. To day throughout the country many of us are communicating with others that also speak Polish as well as our native English and increasingly languages like Czech, Slovak, Lithuanian, Turkish, Hungarian, French and Latvian. This is difficult for those of you in the front line as your Lithuanian may not be anywhere as good as their English even if their English is considered poor. That is where Clairetalk, Two Can Talk and Talking Tutor come into their own as you can type in English and have it spoken aloud in all of these languages. To speak across languages Two Can Talk is great as they can then type in their language and you can hear it in English. Brilliant at A and E when decisions need to be made fast and in schools or doctors surgeries where you need more in-depth conversation and also a record of the conversation. Celebrate with us and look out on our Facebook page for a great deal Thursday only. For those readers of this blog this story will come as no surprise. You are already aware of the accessibility you have to languages you do not speak in order to communicate with colleagues, friends, business partners or customers. This news article suggests that Machine translation is becoming critical to businesses faced with the challenge of providing information to customers, staff and partners in multiple languages and in near real time. We know this is a fact as daily people are asking to use our products to support them with this day to day and face to face situation from hospitals to schools and businesses. The following comments have been made from this article in computer weekly. Marcu believes businesses will always need perfect translations that only humans are capable of, but says the core challenge for businesses over the next five to ten years is in using technology to deliver information to customers, staff and partners in multiple languages and in near real time. And for us at EMASUK this statement is so true. I have long said that if you are the person who has a customer, patient or child in front of you and your languages are not compatible how to do ensure communication? Add to this when it becomes life threatening or an emergency and both parties get very stressed. Using Talking Tutor, Two Can Talk or Claire Talk can support these times until an interpreter can be found supporting both parties and ensuring via communication the correct help is sought. Globalisation and the fact that customers and employees can be in all corners of the world means businesses have to communicate internally and externally in different languages. “In 20 years’ time, learning a language will be for passion, not business,” said Marcu, referring to a future where businesses will use software to communicate with customers and colleagues who speak different languages. I was only saying yesterday that due to a problem we have had with some translators/interpreters recently i.e. they are not academically up to the level needed for schools to support children with the academic words and phrases they need, maybe the use of online tools and bespoke services like ClaireTalk, Talking Tutor and Two Can Talk will be increasingly used in all areas of society. My thinking was that actually being aware that the translation rate is 95% plus makes us as teachers/business people and managers aware and look for the possible error, so rather than it being a negative it is actually positive for the people using the system. The alternative is if you put all of your faith and trust into a translator and cannot check if they use incorrect terms or words we believe the system is working until we get a nasty jolt. It was therefore with interest that when this arrived in my email box today it seemed as though a message was being sent that maybe I was on the right lines. It appears that young people are using these technologies on a daily basis. 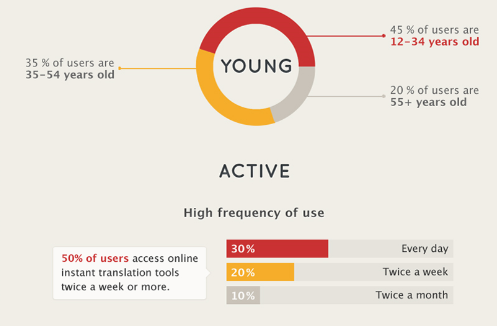 Any language teacher knows that online translation tools can be a double edged sword. The technology that enables students to quickly and easily look up a word or phrase can suddenly turn into a tool they use to try to translate entire papers for them. Double edged sword aside, online and mobile translation tools have come a long way, and are being used more than ever, especially with the availability of mobile technology. 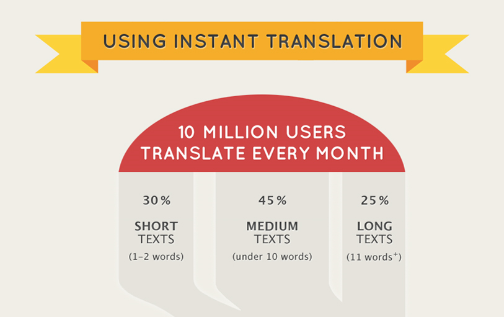 See some of the trends in online translation tools. Users of Clairetalk, Terry and Two Can Talk are already part of these statistics. If you are interested in finding out more contact us via info@emasuk.com or 0845 009 4939.